Adam van Koeverden reflects on his time representing Canada as an Olympic athlete and calls on others to support improving the lives of children through the power and impact of sport and play. It is a little ironic that some of my most Canadian moments have happened so far away from home. It doesn't get much more patriotic than marching in an Olympic ceremony with fellow Canadian athletes; my voice will never be too hoarse to scream O Canada with my fellow Olympians. Watching the Tragically Hip concert at Canada Olympic House on Saturday night was like riding an emotional roller-coaster in a tropical storm of feelings with all of your best friends. When Gord Downie belted the songs that helped define our country's musical identity, we sang along with him. When he broke down and cried, so did we. We all squeezed the stick and we all pulled the trigger, and all I remember is sitting beside you. The next morning I slept in a little and walked in the rain to Ipanema's best coffee shop. It's called Kraft, run by an Aussie dude and his Carioca wife. He told me he didn't know a thing about coffee when he opened the place, just that he missed a good flat white from Perth and he thought it was weird that Brazilians export their best beans. His joint was packed with Aussies, Kiwis and Brits every time I went for a coffee. I walked to the bridge that goes over the little river that flows from the Lagoa (where the rowers and canoeists raced our boats) to the Atlantic Ocean. It was low tide so the water flowed out into the brackish abyss. I thought about how it was all over. 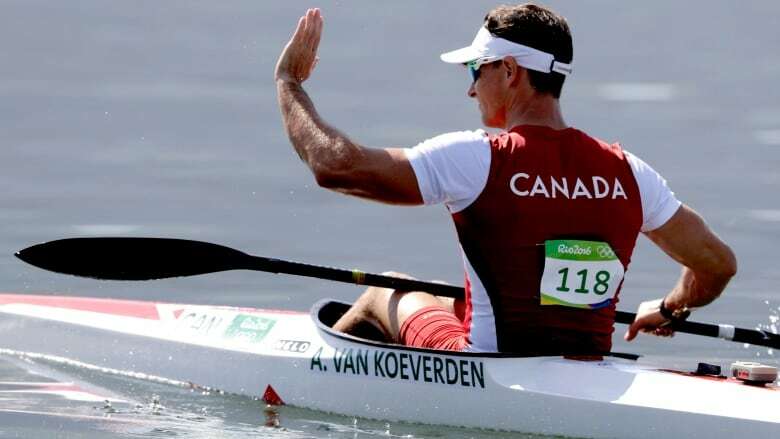 Not just the regatta, not just the 31st Olympiad, but my experience as a Canadian Olympian, too. I imagined the little river carrying our sweat and tears and dreams and quadrennial aspirations out to sea. Only less significant now, since they are a part of history rather than the present. Only smaller in the sense that they are among the sweat and tears of every Olympian who has ever left it all out there for the sake of a perfect effort. Rio is a real city. It was busy and bustling throughout the Olympics, not in defiance of the Games, but in the same way it just goes about its daily business regardless of what circus is in town. I rode my bike past commuters and kids trying to get to school every morning on my way to the venue. Everyone was polite and kind, even when I was riding on the sidewalk. The attention a city receives when it is selected to host the Olympic Games may be a little superfluous, but I strongly believe it leads to an important conversation and a deeper understanding of world issues. Global ones such as climate change, which was one of the impactful themes of Rio's opening ceremony, as well as local issues such as the living conditions in Rio's favelas. Our direct overnight flight home Tuesday was well co-ordinated and quick; I slept most of the way. Back in Toronto, I walked to my local coffee joint and wondered if those beans were from Brazil, too. People were in a rush to get to work here as well, and I thought, "you know, this place ain't so different." There was a homeless guy who slept on the stoop of our hotel in Ipanema. He'd wake up every morning surrounded by the granola bars and bottles of juice that we'd get at breakfast and leave for him. In Toronto, I live close to a park where people sleep as well. I think Canada is the best, and as I tweeted while still dripping sweat from my final race, I've never been more proud to be a Canadian. I'm inspired by our team's performances, but I'm even more moved by their conduct and character off the field and out of the water. I'm inspired by Rosie MacLennan's generosity through her work with Jumpstart, and by Clara Hughes' incredible work with Bell Let's Talk. As I reflect on how fortunate I've been to compete for Canada, I consider the access to facilities and world-class coaching that I've enjoyed. I think about how when I turn on the tap to fill up my water bottle, I completely take for granted the clean water that comes out. When I get hurt, I have access to great health care. If I need someone to talk to, there are services available. Right to Play (RTP) has a program called PLAY, which stands for Promoting Life-skills in Aboriginal Youth. I've visited programs all over Africa with RTP and I'm inspired by what I've seen on the field. I'm further heartened to know that we are working domestically with a similar goal in mind — to improve the lives of children through the power and impact of sport and play in our indigenous communities here in Canada. I'm going to follow in the footsteps of my teammates Rosie, Clara and others, clear out my personal chequing account and make a $5,000 donation to Right To Play's PLAY program. I'm appealing to Canadians to join me in supporting this cause which is so close to my heart. My neighbours and friends and fans and folks on social media have been so generous with their words of support and kindness. It's my hope that we can come together and be generous with our collective wallets as well. Perhaps the most Canadian thing I've repeatedly read on Twitter and Facebook has been along the lines of "Congrats on your kayaking career, I'd like to buy you a beer." So how's this for an idea? Instead of a beer, donate $5 to Right To Play. Or if you're up for buying a round, donate $50. That's the best kind of "cheers" I can imagine. Whatever we raise I am confident that as a result, more kids are going to have access to life-changing sport and play opportunities and programs in some of Canada's most vulnerable communities. That's a kind of victory we can all be proud of. You can make a donation to Right To Play's PLAY program HERE. If we needed any further proof that Canada is amazing, the inspiring performances and world-class character of our Canadian Olympic team are surely testaments to not only how great we are, but how much potential lies within all of us. And just like any world-class athlete, we should continually strive to be better, to be the very best version of ourselves. It's been my experience that the best way to accomplish any great goal is to do it together. Thanks to everyone in Canada for all of the amazing support, and for considering a donation to Right To Play.